Tips & Tricks: How to Start a Redesign? What's your favorite color? Often any good redesign starts with this simple question. In Lauren Nelson's case, it was her tried and true, blue. 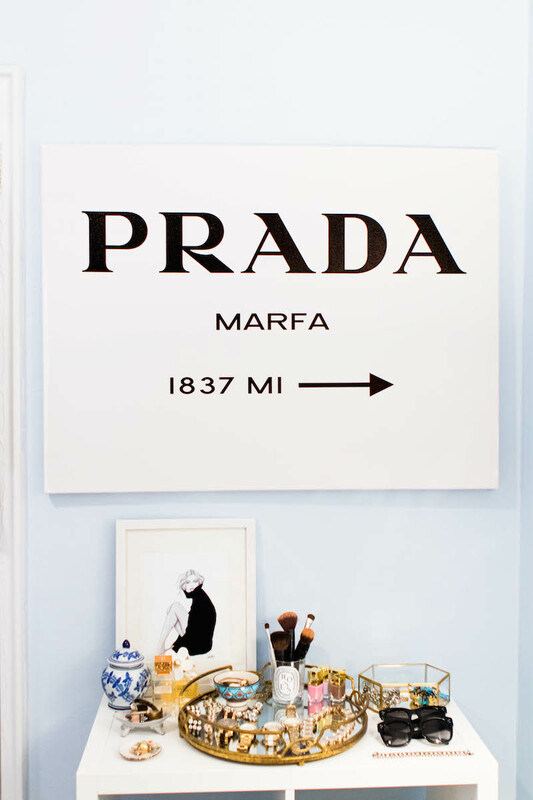 Once that decision was made, the redesign for her bedroom was set in motion. 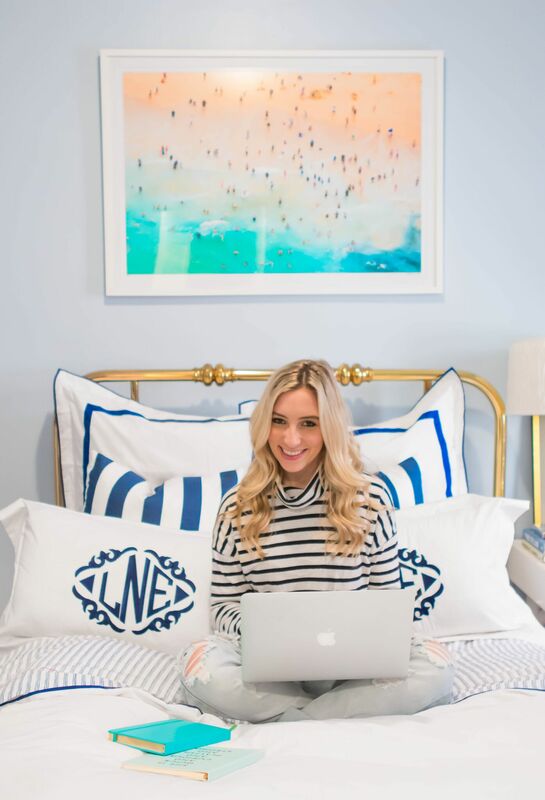 Lauren, won't you tell us about your inspiration behind your bedroom redesign? Also, how'd you land on your Gray Malin selection? 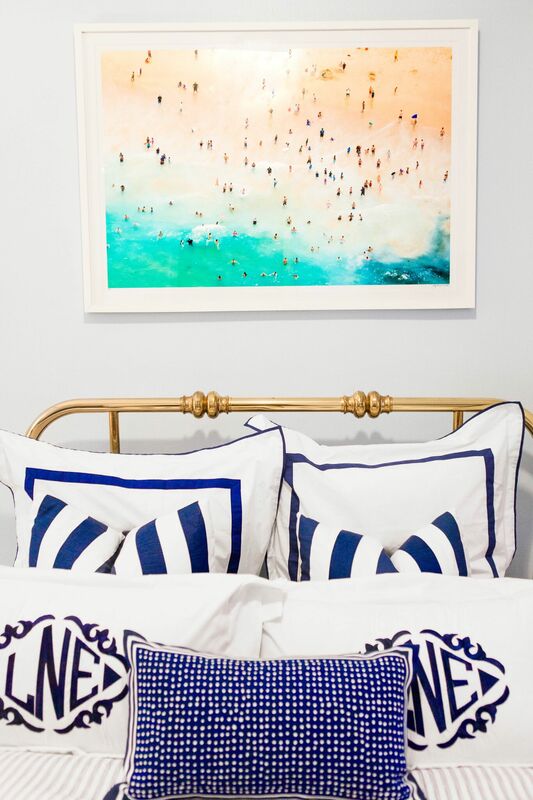 "I knew I wanted some sort of amazing blue hue as the color of my bedroom. 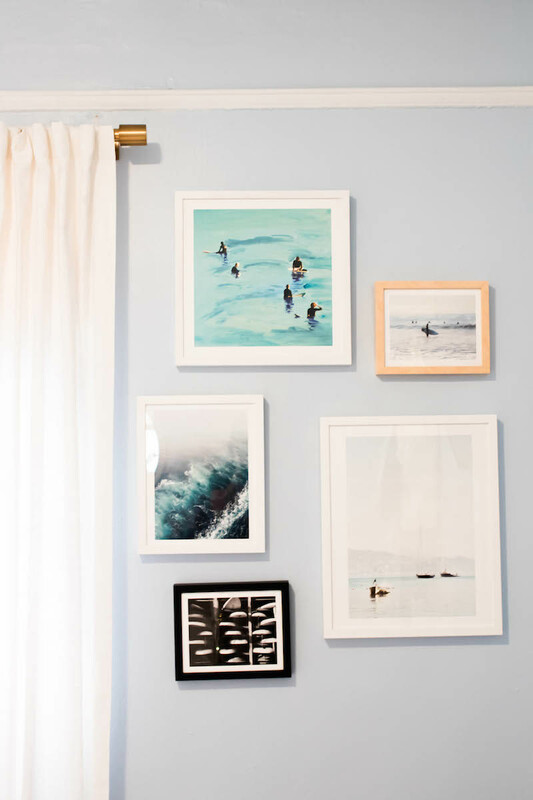 I painted a few different squares on my wall (like a dark, medium and light blue), ultimately ending up going with a very light blue , simultaneously I was deciding on which Gray Malin print I was going to order. I think at one point I held up my computer to the patch of paint on the wall. Honestly, picking my Gray Malin may have been one of the hardest design decisions when redesigning my room!! It’s easily a main focal point with my bed so I went back and forth for days! I am such a fan of the La Dolce Vita and A La Plage series, so I knew I was going to pick something from one of the two series. I also wanted something that I wouldn’t get tired of and could grow into future spaces with me. I ultimately chose the Maroubra Bay Swimmers as it’s a classic beach scene – very me. The best part about this piece is that I can easily see it transitioning to a living room or dining room one day. Happy with my decision, I headed out of town for a friend's wedding, while my super painted my bedroom, so the timing was perfect. A few days after my return, my framed print arrived and then I really got down to business on the rest of the room." Tell us about your style when it comes to decorating your home/dream space, what kind of aesthetics, themes, and details do you migrate towards? "I would say my style is classic, nautical and preppy (thanks to my Mom). I’m very much inspired by living on the East Coast. 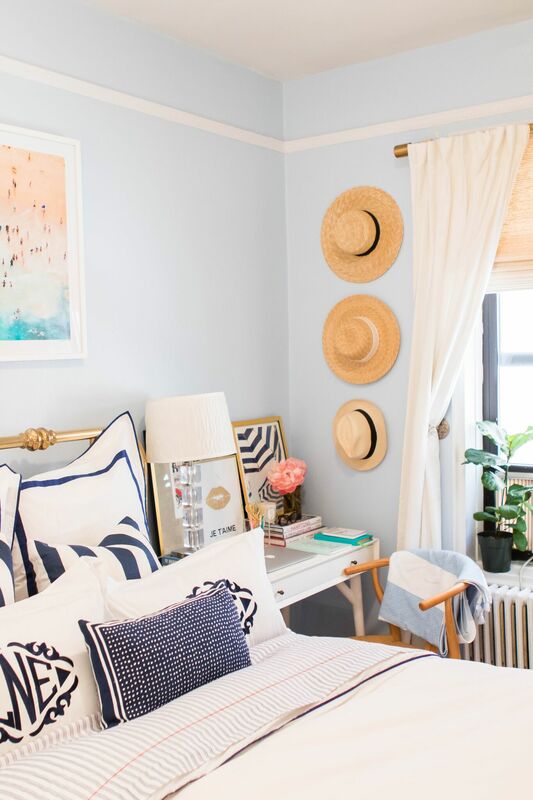 Give me a navy and white striped anything – and I’m a happy girl. I also like to mix and match pieces of furniture – mid-century modern with more traditional pieces. I would say my bed and desk area is a great example of this. I found the desk at West Elm (it’s their mini mid-century desk, perfect for small spaces) and my brass bed was my Mom’s from when she was growing up (Yes, my Grandma also had great taste!). Brass is a very common theme throughout my spaces – brass doorknobs, pulley’s, curtain rods, you name it. Love me a brass accent." When you're not redesigning like a pro, what else are you up to? 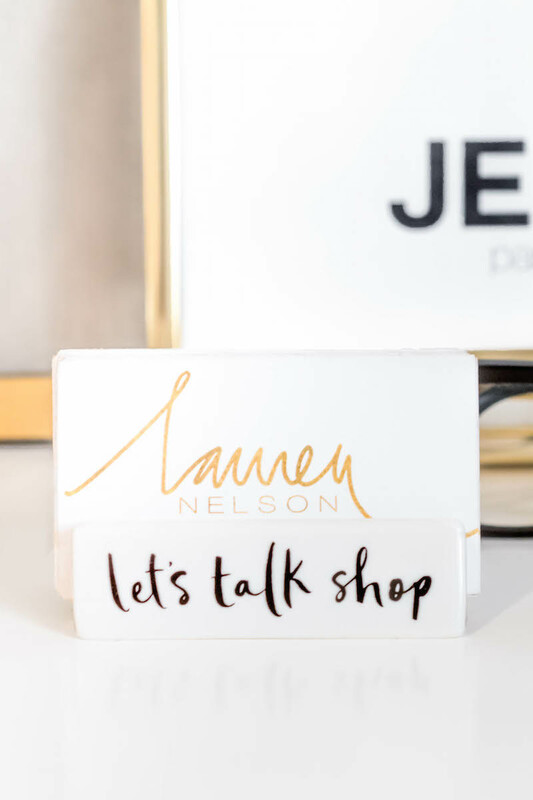 "I live in New York City, and by day I work in advertising sales and by night I run my lifestyle blog, Lauren-Nelson.com. For fun, I love a good brunch. On the weekends you can find me running around NYC or hanging with my cousins in Connecticut. 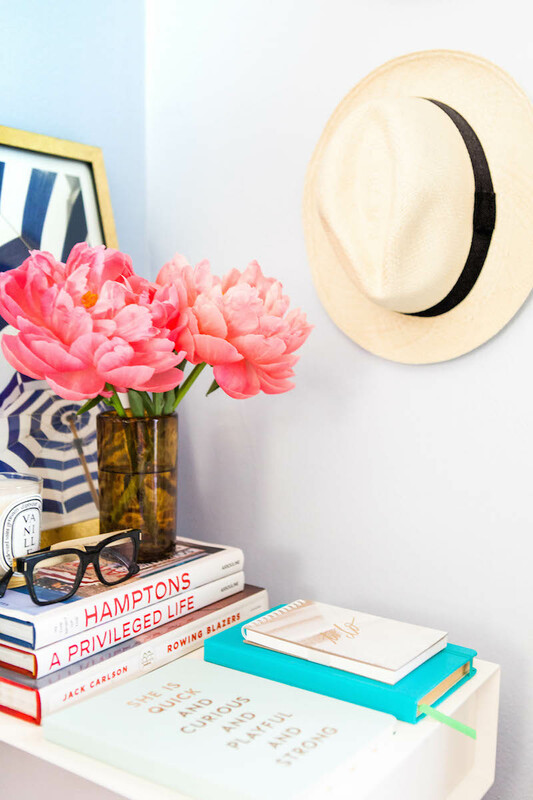 In the summer, I pretty much travel every weekend, whether it’s for my blog (I love working with hotels), for friend’s weddings, showers or bachelorette parties, or I’m also in the Hamptons quite a bit (East, Sag Harbor and Montauk being my favorite destinations). Don’t worry, I have broken down Montauk in 48 hours for you." "I feel like Gray and I get each other – you know what I mean?! 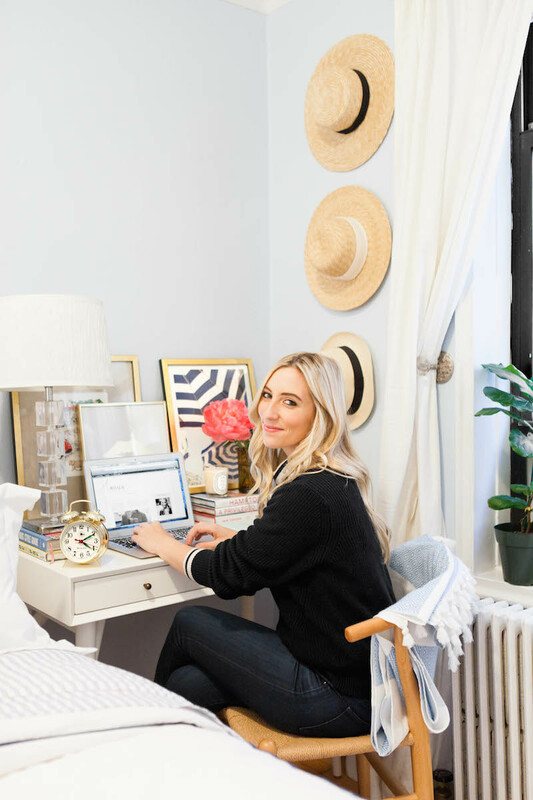 No, but what I really love about the “Gray Malin” lifestyle is that it’s aspirational, inspirational, and relatable. His aesthetic is on point and his work can take you to places you have never been. Or if you have been, his photography can remind you of fond memories or vacations. They are great pieces of art to inspire wanderlust all year long in my opinion." Well, we certainly couldn't agree more, and we're happy that Gray's work helps you make every day a getaway! To learn more about Lauren, check her out on Lauren Nelson. Digging her Preppy Nautical Style? Take a look at her friend and ours style, Julia of Lemonstripes, who happened to make the introduction for us to all make this post a reality.